This salad. I have been obsessed with this summery salad since it first debued at Panera. Berries, pineapple, mandarin oranges, feta cheese, and grilled chicken. I’ve tried for years to re-create it at home. Even posting a similar one here, although I never have been able to get the dressing quite right at home. So, you can guess how excited I was a year or so ago when I found the Panera poppyseed dressing in the refrigerator section at Target (note: I can also buy it at Kroger, although it is usually slightly less expensive at Target). I now have the hubbs hooked on it too. I’m not kidding when I say we ate this weekly until we had to retire the grill for the winter. Now that the warmer weather is creaping back and berries are creaping back into the stores, we’ve picked that habit back up. It is now at the point where I prefer our homemade version — we add WAY more fruit! The recipe is pretty quick and easy. Washing berries, draining the pineapple and mandarin oranges, and grilling the chicken. We use a variety of berries depending on store sales/which ones look better, but the traditional is strawberries, blueberries, and raspberries. You’ll notice blackberries replacing the blueberries in this photo. Use whichever berries you like! As for the salad, you can cut up an entire head of Romaine lettuce or you can buy the pre-mixed salad mixes. We honestly do both depending on the time we have available. You could even use pre-grilled chicken to make this a layer and go type of dinner. Preheat the grill. Salt and pepper both sides of the chicken breasts. Grill until cooked through. Let set for 5 minutes. Slice. Divide the salad greens between 4 plates (we usually do 2 plates and 2 bowls for lunches). Top with the berries, pineapple, mandarin oranges, pecans, and feta cheese. Top with the sliced chicken. Add dressing in desired amounts. Does anyone else falter slightly when asked which food is their favorite? Please tell me I’m not alone here. I feel like I like so many different flavors that it is hard for me to pick, although I will admit that Mediterranean is amongst my favorite. As long as we stay away from goat cheese. I just can’t do the “tang” and that flavor stays on anything it remotely touches on a plate. Goat feta/cheese = not for me. Cow feta = I could eat with a spoon. I first talked about these Shawarma topped fries in my menu plan, but at the time, I wasn’t sure if I would serve this over fries or rice. I will admit I’m glad I went the fry route. Crispy skinned potatoes also are awesome. That said, I’m sure rice would work too and as long as you’re using a packet, would make this quicker for a weeknight meal. My recipe tips would be to be sure to cut the potatoes on the thinner side as this will allow for more crisping. I would also recommend spraying your foil with non-stick spray for the fries. Mine stuck to the foil a bit despite the olive oil (which was slightly disappointing as I lost the crispy sides on some of them). I also subbed some of the mayo out for plain Greek yogurt on the sauce, and it worked well for us. Add 1/2 lemon juice, 2 tablespoons olive oil, spices, and garlic to a large ziplock bag. Squash to combine. Add the chicken and marinate in the refrigerator for at least 1 hour or up to 12 hours. Increase the oven temperature to 425 degrees.Re-spray the foil with non-stick spray (or replace the foil). Slice the potatoes thinly into fries (can leave the skins on). Toss in a bowl with 1-2 tablespoons of olive oil and salt and pepper. Bake for 25-30 minutes or until crispy, stirring halfway through. Meanwhile, combine all the ingredients for the salsa in a medium bowl. Stir to combine and set aside. Add all the ingredients for the garlic sauce in a bowl. Mix. Add water, a little bit at a time, until you reach your desired consistency. Top the fries with the chicken, salsa, and garlic sauce. Serve. First of all, Happy St. Patrick’s Day! I have a very non-Irish dinner idea for tonight. This becomes a real problem for me as Mexican/southwest flavors are some of my favorite things for dinner. 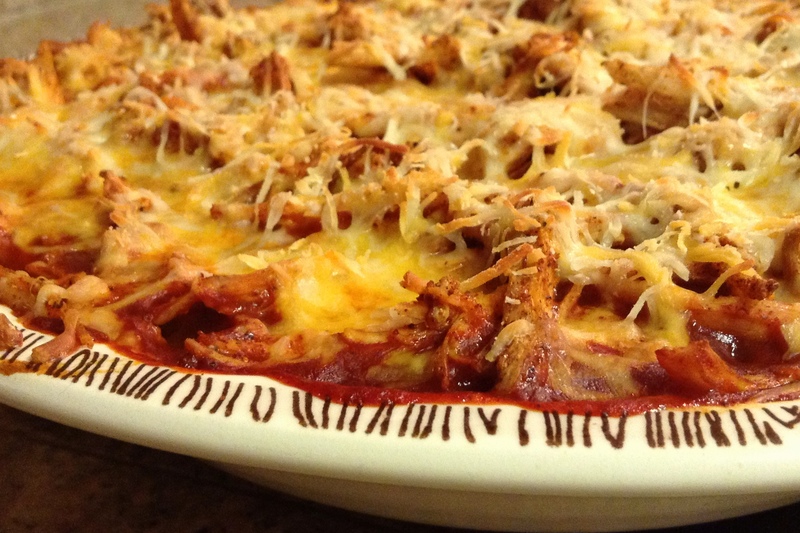 Enter these enchiladas from Iowa Girl Eats. I wish you could even just smell this salsa over the blog world. So. Good. I warmed up a leftover enchilada for lunch this week, and all of my coworkers were wondering what smelled so good! The entirety of this dish does take a little bit to put together. First, you make the salsa, then cook the chicken, grate the cheese (ugh, but worth it), assemble, and bake. I really think the salsa is what makes this dish. I almost can’t wait to make this again this summer with some garden tomatoes as it was great with mid-March grocery store tomatoes. Don’t substitute traditional enchilada sauce here. It isn’t hard and is worth the time. Find a day/weekend where you can set aside time to make it. I promise you won’t regret it! I’m sure you could make these quicker by making the salsa and chicken ahead of time. IGE recommends that it can be made up to 3 days in advance, but I’m finding myself wondering if it would be freezable as that would make the time commitment for this next to nothing (probably almost a 30 minute meal). For the salsa, preheat the oven to 425 degrees. Line a baking sheet with foil and spray with non-stick spray. Add tomatoes, poblano pepper, and onion to the baking sheet then brush with extra virgin olive oil to coat. Place the head of garlic in the middle of a smaller piece of foil and drizzle generously with olive oil. Seal the garlic into a pouch of foil and place on the baking sheet. Roast for 20 minutes, flipping everything but the garlic halfway through. Decrease the heat on the oven to 350 degrees. Once cool enough to handle, transfer the tomatoes and onion to a food processor or blender. Cut the top off the poblano pepper and remove any seeds and membranes. Add to the blender. Squeeze all of the garlic cloves out into the blender (they should be soft). Add cilantro, lime juice, 1 Tbsp. salt, and 1 tsp. black pepper. Process until smooth then taste and add more salt and/or pepper if desired. Heat olive oil in a large skillet over medium heat. Add chicken, onions, garlic salt, and black pepper and sauté until the chicken is cooked through. Set aside. Spray a baking dish with non-stick spray. Spread 1/4 to 1/2 cup of the prepared salsa into the bottom of the dish. 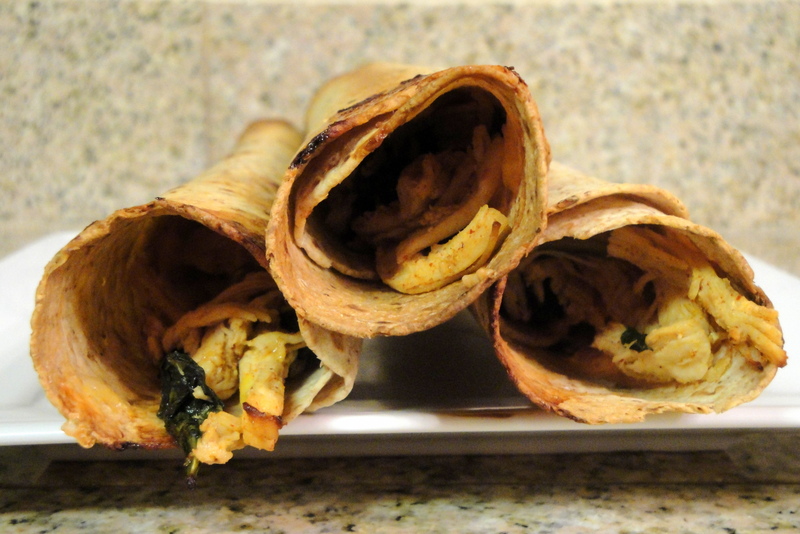 Wrap each tortilla with a scoop of the chicken, 1-2 Tbsp. of salsa, and 1-2 Tbsp. shredded cheese. Place seam-side down in the baking dish. Repeat until all the ingredients have been used. Cover the enchiladas with salsa; you may have some salsa leftover. Top the enchiladas with the remaining cheese and eat the remaining salsa with chips if desired. Spray a large piece of foil with non-stick spray and cover the baking dish (with spray-side down). Bake for 20 minutes. Switch oven to broil, remove the foil, and cook 2-3 minutes longer or until the cheese begins to brown. Remove from the oven and let rest for 5 minutes after baking. While the enchiladas are baking, add the remaining chopped tomatoes, cucumber, jalapeño, onion, cilantro, lime juice, salt, and pepper to a small bowl. Toss to combine. 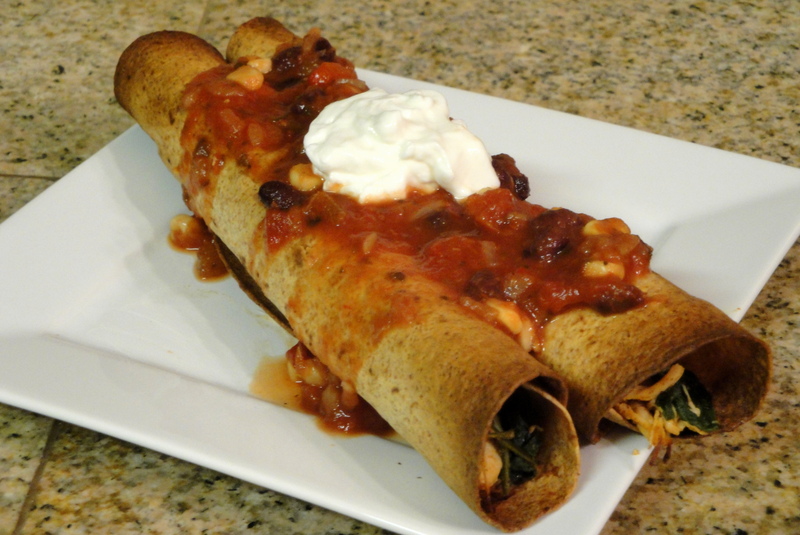 Top each enchilada serving with a scoop of pico de gallo. Well, hello there blog world! It’s been quite awhile! Life has gone on a little since I last regularly updated this little blog. I’ve moved. Across several states. Twice. Completed two half-Ironman distance triathlons and one full Ironman. With the new Ironman tattoo to prove it. The first of these lead to the ultimate demise of my blog. Turns out when you’re working full time and training 8-10 hours (or 14-16 for the full Ironman) a week you end up hungry. Really, really hungry. And you don’t really care what the food you’re eating looks like (definitely not photo ready) or how “original” the recipe was. If it’s food, you eat it! A bit about our meal plan philosophy. The hubbs and I meal plan to an extent, however we are not rigid about it. We typically will pick out 4-5 recipes per week which and make whichever recipe happens to sound good that day. The other days are supplemented by leftovers, about 1 dinner out per week, and standard staples we keep around the house. We often turn to these staple meals on the days where we’re either too busy and/or too tired (read: triathlete on the verge of hangry if I’m not fed now nights). Most of these things aren’t really “blog worthy”, but I can elaborate as they come up. Cheers to getting back in this game! Do any of you have specific ingredients that often predict what you will be making/eating? Those items that you cannot get enough of and automatically make an item included in your dinner or menu plans? I have several – kalamata olives, caramel, roasted red peppers, butterscotch chips. I could give a few more, but as you may have guessed balsamic vinegar is pretty high on my list. 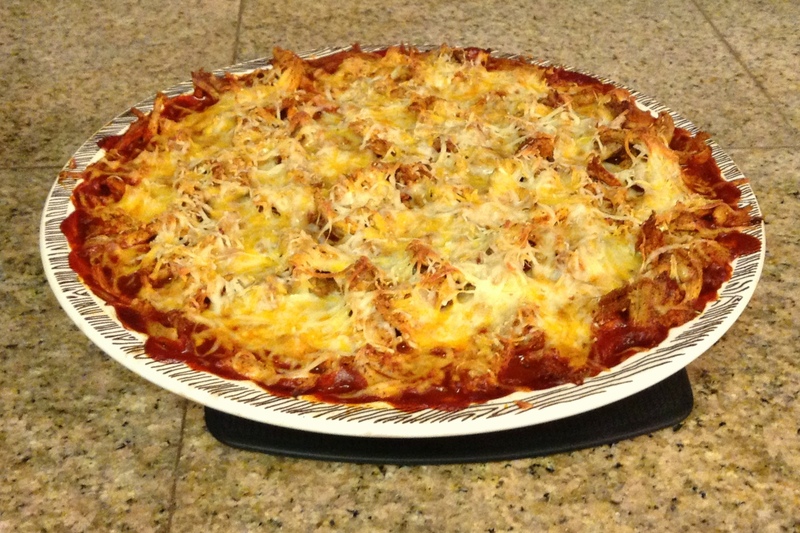 Enter this smothered chicken recipe by Iowa Girl Eats. Truthfully, this has another ingredient both the hubbs and I cannot get enough of – tomato, basil, and garlic bruschetta from Trader Joes. They sell both a fresh and canned version, and both are awesome. We end up eating this bruschetta topping on toasted baguette slices at least once a week. Not kidding. 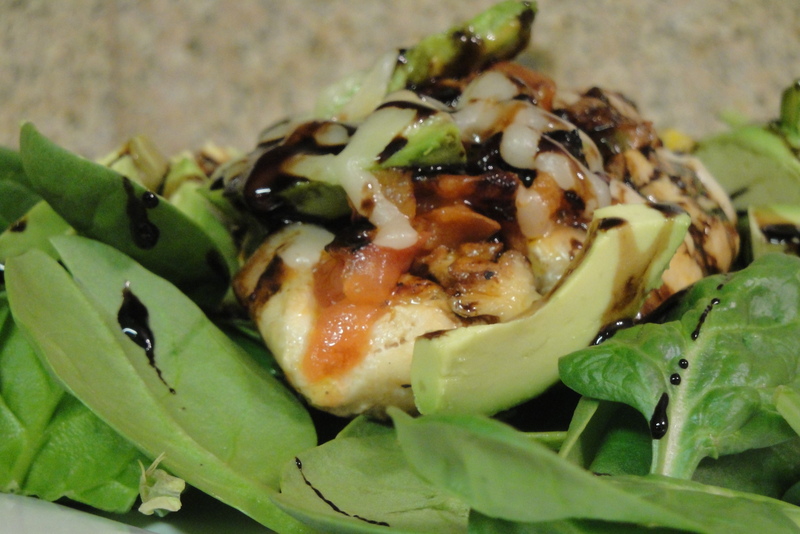 Layer those with some avocado, chicken, and mozzarella cheese and you have this recipe. The recipe itself is pretty simple. If you have never reduced balsamic vinegar, it is possible to burn it. The recipe states it takes about 20 minutes, but you probably should keep and eye on it and stir it a few times during that down time (not that I would know anything about burning the vinegar). This can be done ahead of time, making the recipe a great choice for a busy night. 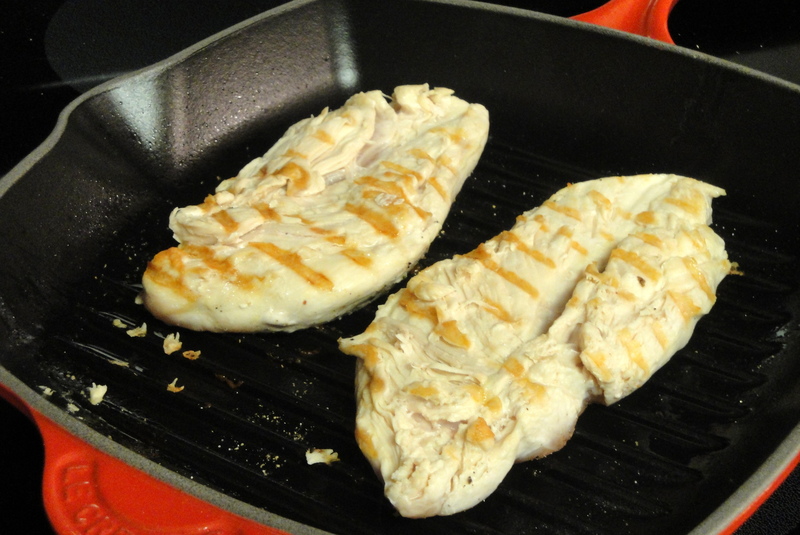 I cooked my chicken breasts on a grill pan, although they could be prepared in anyway you would like. Now that it’s officially spring, I am thinking the outdoor grill would be nice. Layer the cooked chicken with your toppings, slide it under the broiler, and you’re ready to eat. Enjoy! Pour balsamic vinegar into a small saucepan then bring to a boil. Turn the heat down to medium and continue to simmer until the vinegar is thick enough to coat a spoon, about 20 minutes. Set aside to cool. Place the oven rack in the top position. Preheat the oven to broil. Warm a grill pan and warm over medium-high heat. Brush the chicken breasts with olive oil and season with salt and pepper on both sides. Add the chicken breasts and cook until cooked through and no longer pink in the middle. Can also bake or grill the chicken breasts if desired. Spray a small baking pan with nonstick spray. Add the chicken breasts to the dish. Spread the bruschetta topping over each chicken breast. Top with a few avocado slices and mozzarella cheese. Place the dish in the oven and broil for 1-2 minutes or until the cheese is melted. Plate the chicken over a bread of spinach. Split any remaining avocado slices between the plates. 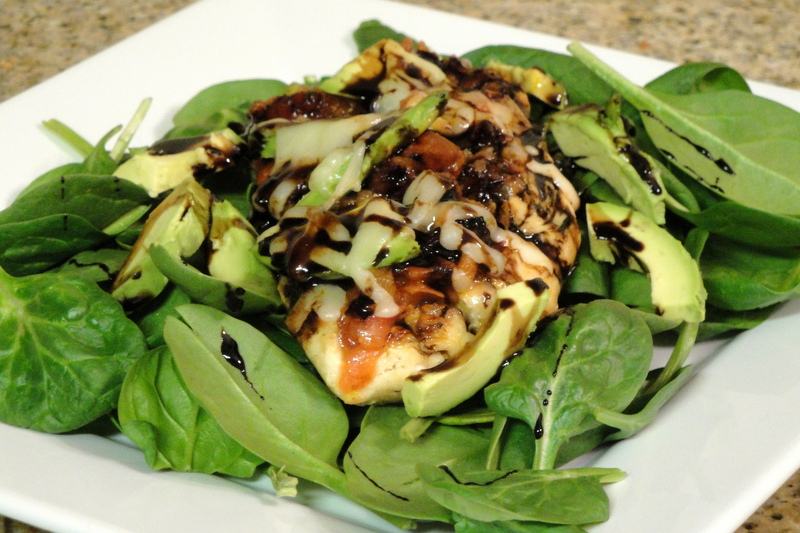 Drizzle the chicken and spinach with the reduced balsamic vinegar and serve. I am so excited to share this recipe with you. First of all, it is comfort food in its finest. Comfort food that will not break your diet. What’s not to love? Second, I actually have a “pi” for Pi Day! It is rare that I am aware of a foodie holiday early enough that I can have a recipe prepared in time to post. I know this makes me a little bit of a nerd (and my husband would definitely agree), but I promised myself I would find something to share for Pi Day. Mine may not be of the sweet variety, but I would definitely say it counts! As I eluded to above, this meal is definitely warm, filling, and satisfying. 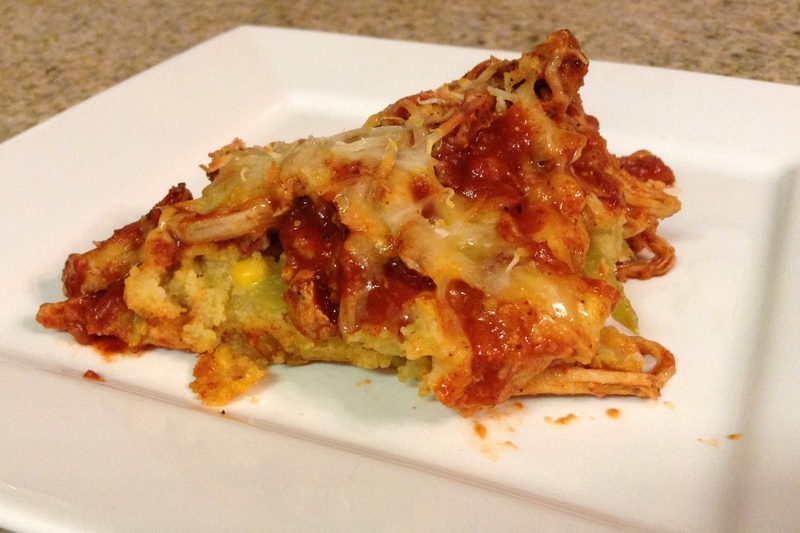 First, you prepare a “cornbread” crust and layer that with enchilada sauce, shredded chicken, and cheese. While it sounds like a diet bust, as long as you control the amount of cheese, none of the ingredients are too unhealthy. Served with a green salad or other veggie on the side, it makes a pretty balanced meal. The recipe is originally from Pinch of Yum. I updated it a little for us, mostly making the cornbread crust from scratch. I tend not to keep baking mixes in my pantry, and I promise you probably already have most of the individual ingredients to make the cornbread on hand anyway. One thing to note, don’t expect the crust to be of the same texture as normal cornbread by itself. With the creamed corn and being baked underneath the chicken mixture, the cornbread crust comes out “wetter” than it were if it were cornbread alone. Different, but still delicious in my opinion. If you’re still looking for dinner plans, join me in celebrating Pi Day and try this out. Enjoy! Preheat the oven to 400 degrees. Spray a 9-inch pie plate with nonstick spray. Set aside. Combine the first 12 ingredients (milk through the green chiles) in a medium sized mixing bowl, using only 1/2 tablespoon of the taco seasoning. Stir only until just barely combined. Some pieces of flour/cornmeal may remain. Transfer the mixture to the prepared pie plate. Bake for 20-30 minutes or until set, starting to brown on the edges, and a toothpick inserted just comes out clean. Do not let it bake too long, as it will continue to bake once topped with the chicken mixture. While the cornbread is baking, combine the chicken with the remaining 1 tablespoon of taco seasoning. When the cornbread is finished baking, pierce all over the surface with a fork. Pour the enchilada sauce over the cornbread. Top with the chicken and the cheese. Bake for about 15 minutes or until the cheese melts and the dish is bubbly. Remove from the oven and let stand for 5 minutes. Top with cilantro if desired. I was clearing the masses of emails out of my personal account recently and noted a foodie email with recipes for Mardi Gras. Mardi Gras already? Really? Not that we ever really have done much to celebrate the holiday, it still was completely off my radar this year. I have been to New Orleans a couple of times, and outside of the seafood, I really enjoy the intense flavors in the food. Given that much of the authentic Cajun food contains seafood, making non-seafood versions at home is usually my best bet. 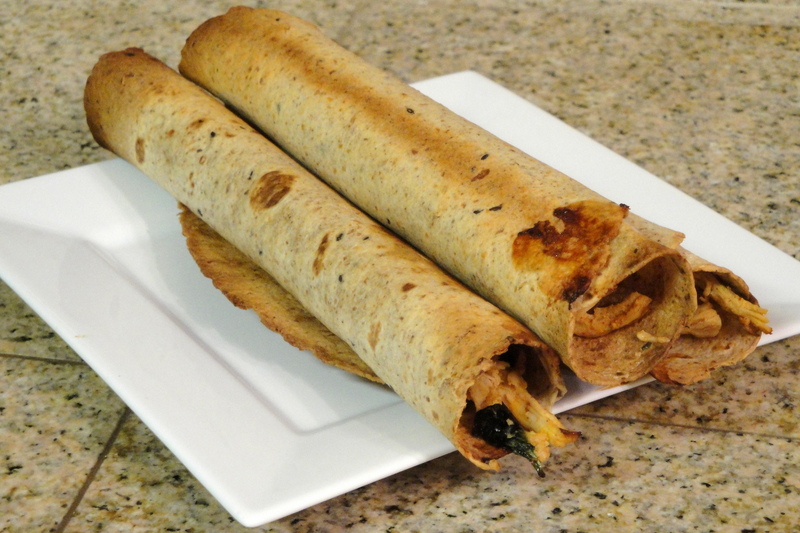 This recipe comes from Mel’s Kitchen Cafe. 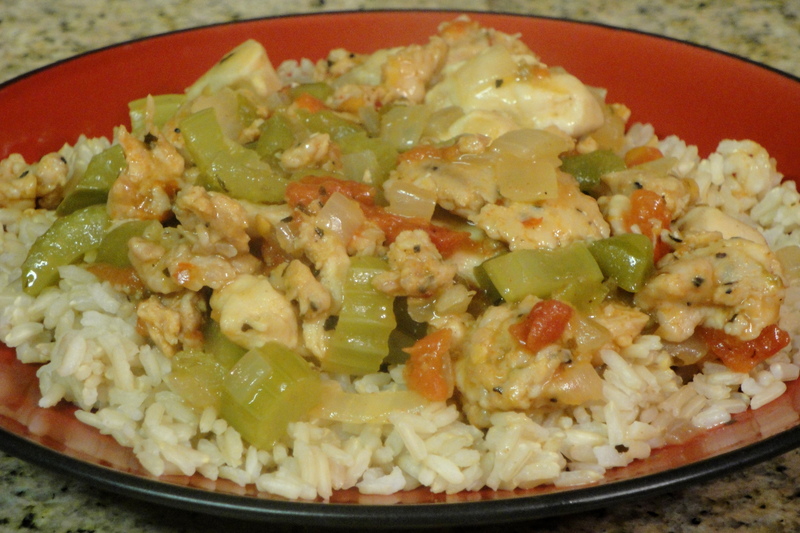 It starts with some traditional Cajun ingredients – celery, bell peppers, onion, and garlic, and ends up as a homey, filling, fairly healthy skillet meal. We have a local grocery store that makes their own chicken and pork sausages, so I swapped in crumbled spicy chicken sausage for the sliced sausages. Don’t got light on the Cajun seasoning either. Maybe it is just because we are completely obsessed with it, but I think the Cajun seasoning completely brings this dish together. I added just a little more than called for in the recipe, although it can be varied according to your preference for level of spiciness. Enjoy! In a large, high-sided skillet or stockpot, cook the sausage and chicken over medium heat until cooked through. Set the meat aside and drain the fat from the skillet if necessary. Melt the butter in the same pot. Stir in the flour and cook over medium heat, stirring constantly until the flour starts to brown, about 1 minute. 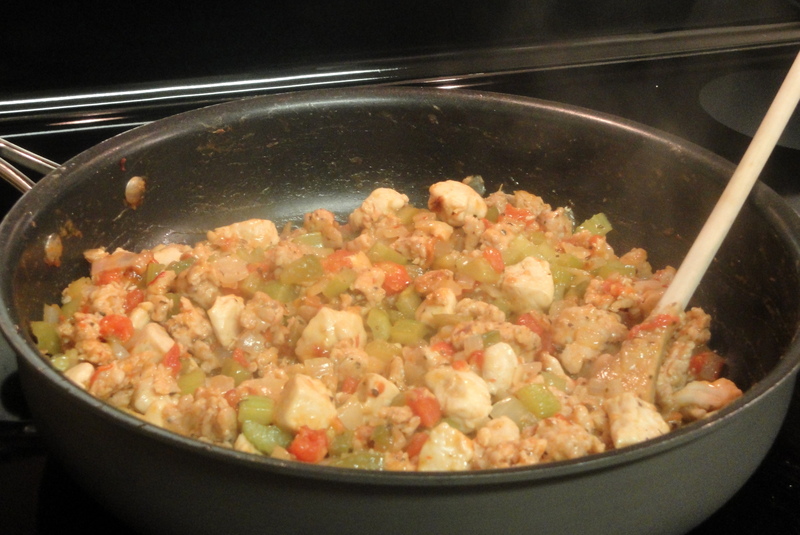 Add the vegetables, basil, Cajun seasoning, diced tomatoes with green chiles, and sugar. Stir well. Bring the mixture to a simmer over low to medium-low heat and cook for 15 to 20 minutes, stirring occasionally until the vegetables are slightly tender. Add the sausage and chicken back to the pot, cook for another 10 minutes, stirring as needed. Add the chicken broth and simmer for about 5 additional minutes. Stir in the rice. Can continue to cook for a few minutes to obtain desired texture, if desired.